FILE - Senegalese President Macky Sall, front left, responds to journalists' questions during a press conference. Senegal’s presidency is getting into the fact-checking business. “Fake news is flourishing. It is something people cannot control and that can end up affecting politics, society and the way people behave," says the Special Advisor to President Macky Sall, Ousmane Thiongane. It is a concern being raised around the continent, and around the world for that matter. A recent study of the Kenyan electoral campaign released in July found that 90 percent of Kenyans had “seen or heard false news” about the election, much of it shared via Twitter, Facebook and WhatsApp. Thiongane recalls how the Senegalese government had to intervene earlier this year amid panic over false rumors about "plastic rice" imported from China. Senegalese authorities publicly tested rice imports and broadcast interviews with scientists to dispel the myth that had spread in several African countries via social media. The presidency launched its new initiative on October 12, inviting social media users to flag questionable posts regarding the presidency using its youth-oriented social media account Generation Senegal and the hashtag #STOPFAKENEWS. The initiative’s first, and only, post went up that same day, seeking to debunk criticism of Senegal’s healthcare system, though the post did not specify the source of the claim. Senegal is known to have a relatively vibrant and open media, however the quality of information online can be uneven. 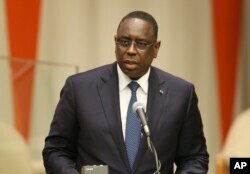 FILE - Macky Sall, the president of Senegal. In Senegal, diffusing false information, defamation and insulting the head of state are all criminal offenses punishable by jail time and fines. The presidency’s new initiative has some rights groups wary. Fatou Jagne Senghor is the West Africa regional director for Article 19, which defends freedom of expression and information. She says tracking social media can be “intimidating” to the public and a waste of government time. Senegal is one of several African countries, including Zimbabwe, Cameroon and Uganda, that have used existing laws to detain or prosecute individuals over social media posts in the past two years. In August, Senegalese singer Amy Collé Dieng was charged with “offending the head of state” and “broadcasting fake news” over a WhatsApp recording in which she allegedly refers to President Macky Sall as a “lizard” and a “sai-sai,” a term in Wolof that could be translated as “scoundrel.” She was released on bail. Dieng’s case followed the detention of a local journalist and three friends for sharing a satirical photomontage of President Sall on WhatsApp in May. The four were charged for “diffusing immoral images” and released on bail. The presidency told VOA the government’s response to Dieng’s case was exceptional because she is such a well-known public figure, and the goal of the fake news campaign is to verify information for the public.